Saturday October 15th — No rain, spotty sun and friendly faces all around, as neighbors from all sides of Licorice Fern Natural Area converged at the trailhead for hot dogs, neighborhood chitchat and a walk through the woods. Kelly had his gas grill (on his driveway area) pumping out dogs ‘n’ brats, people brought snacks and drinks to share. Dogs sniffed, children played, and boys threw things, while Dass, Linda and Bob from “Friends” provided hand-outs and info about restoration plans for the ravine. 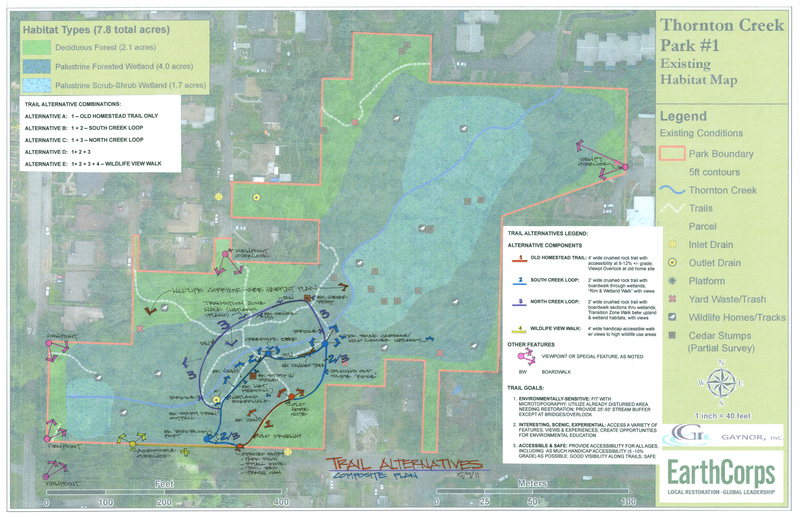 At the third and final public meeting (July 28) for input on the grant for planning for Thornton Creek Park #1, Peggy Gaynor of GAYNOR, Inc. presented her synthesis of the alternatives for trails and overlooks into or along the edge of the Park, and for forest restoration. Next she will compile the background data, the planning history, and the final recommended plans into a final report. In a future meeting with the Department of Parks and Recreation, she will present the report for approval by the Department, which could ask for significant changes. Once a final report is approved, the Friends will produce a number of paper copies to be placed in libraries and schools, and made available to neighbors who request them, while supplies last. This document has been funded in part by the Neighborhood Matching Fund Program of the Seattle Department of Neighborhoods. The information contained herein does not necessarily reflect the policies, plans, beliefs, conclusions, ideas, etc., of the City of Seattle. The City does not warrant the accuracy of any of the information, ideas, conclusions, etc., contained in this document. All are urged to attend the third public planning meeting for Thornton Creek Park #1, recently renamed “Licorice Fern Natural Area on Thornton Creek”. We will be meeting in the usual place, the conference rooms at St.Matthew Parish, 1270 NE 127th Street, Seattle, at 6:30PM Thursday 27 July. Based on comments from that meeting Peggy Gaynor will prepare the final plan proposal to the Parks Department, and eventually there will be a formal plan document available. Hope to see everyone Thursday. 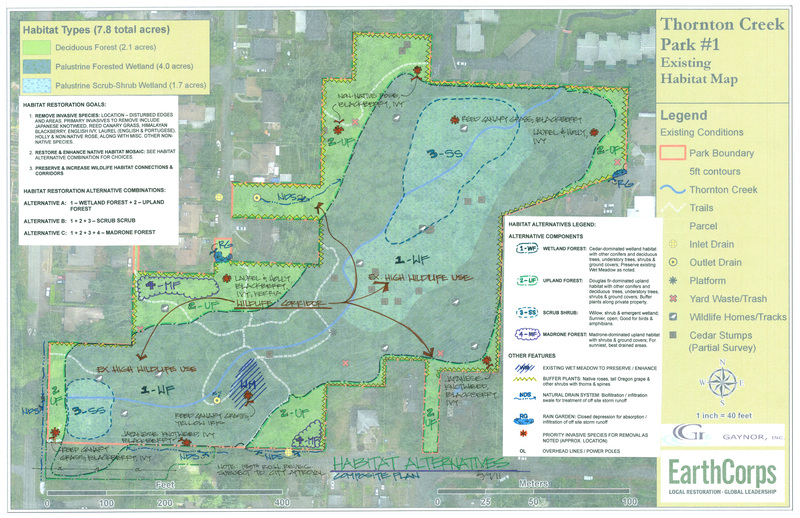 At the second public meeting (May 31) for input on the grant for planning for Thornton Creek Park #1, Peggy Gaynor of GAYNOR, Inc. presented planning alternatives both for potential trails and overlooks into or along the edge of the Park, and for forest restoration. After considerable discussion, votes were taken and tallied on the alternatives for trails and habitat restoration. The results of the votes favored limited trails and favored forest restoration in all the areas presented. The final public meeting is scheduled for Thursday July 28 6:30 – 8:30 PM at St Matthew Parish Conference Rooms, 1240 NE 127th Street, Seattle WA 98125. We will see and discuss the plans that will be presented to the Department of Parks and Recreation for approval. All are encouraged to attend. Join us for a short tour of the Park May 21, based from the South side. Friends of Thornton Creek Park #1 Steering Committee members will point out natural features and discuss stewardship ideas. Meet at 1100 NE 130th Street, approach via 15th Avenue NE. Parking is allowed along the sides of the streets where there is room. Please attend, listen to your neighbors’ opinions, express your wishes, and leave a written comment in our log if you wish. You can suggest a name for the Park. Wednesday, April 13, 2011 6:30 – 8:30 p.m.
Friends of Thornton Creek Park #1, a neighborhood organization, has adopted and is stewarding the Thornton Creek Park #1 Natural Area, between 10th and 15th Avenues NE and north of 130th Street. Friends recently received an $18,000 Seattle Department of Neighborhood Small & Simple Grant for community outreach and planning, with the assistance of landscape architect Peggy Gaynor, GAYNOR, Inc. The planning and design workshops, listed above, are the first step in creating a vision and action plan for the future of the park. Our goals are to preserve and restore the natural habitats, keep the park wildlife-friendly and provide environmentally-sensitive pedestrian access to the park. Please come join your neighbors and provide your input, to create a vision for Thornton Creek Park #1. Friends of Thornton Creek Park #1 are happy to announce the public meeting dates for Planning and Design for the future of the Park. Tuesday, May 31, 2011 6:30 – 8:30 p.m.
Thursday, July 28, 2011 6:30 – 8:30 p.m.